Apples being harvested in central Vermont this fall are smaller and overall yield is down, following trends throughout the Northeast, say local growers. But local consumers can expect plenty of beautiful apples with some added zing, as the lack of rain and hotter temperatures have intensified flavor and sweetness. Rainfall is down by half to two-thirds, according to apple growers interviewed for this article. Growers typically like to see at least four to six inches a month in the growing season; this year precipitation has come in closer to one and a half to two inches. The dry weather is having much the same effect around the state. The Agency of Agriculture, Food and Markets ranks apples as the state’s largest fruit crop, worth $12 million-$15 million annually, with an additional $10 million-$12 million a year from products like apple cider and apple sauce. 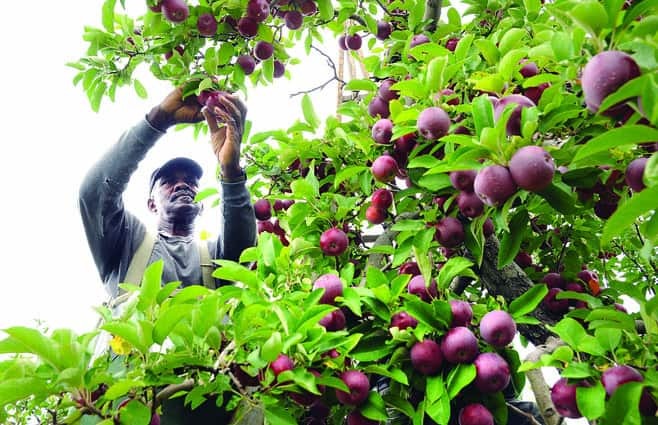 In 2015, the county’s apple growers contended against one of the wettest Junes on record but brought in a bumper crop — what Justis called one of the best of the past four or five years. This year, although lack of rain has yielded smaller harvests across Vermont and throughout the Northeast, many Vermont growers are still counting their blessings in comparison to neighbor growers across state lines. Orchards in some parts of western New York faced repeated hailstorms. And elsewhere in New York, Massachusetts, Connecticut and Pennsylvania, many growers faced what’s called a “short crop” when late spring freezes damaged or destroyed blossoms. The harvest yield has varied between Vermont orchards, too. Stan Pratt, co-owner with wife Mary Pratt of Happy Valley Orchard, reported an excellent yield despite the dry weather. Pratt grows apples on 14 acres in Middlebury and another 20 acres in New Haven. Pratt reported “a lot of apples this year,” especially at their Middlebury site. Because of differences in microclimate and the varieties grown at the two sites, Pratt said that last year was a heavier yield on his New Haven acreage and heavier this year in Middlebury. Apples also tend to bear more heavily in alternate years, though this propensity varies among different varieties. In Cornwall, Sunrise Orchards owners Barney and Christiana Hodges are seeing a smaller yield and smaller but tastier fruit. Last year was a bumper crop with 175,000 bushels. A typical year’s harvest on Sunrise’s 200 acres might total around 140,000 bushels. This year they expect to see a yield 20 to 30 percent less than a typical year. The Hodges have heard concerns from local consumers that the reduced yield in 2016 might mean that local orchards are “running out” but that is far from the case, they both emphasized. Like other orchards across the state and county, Macs predominate at Sunrise. The Hodges raise about 65 percent Macs, about 30 percent Empires, Cortlands and Paula Reds, and the rest a cornucopia of popular and heirloom varieties for everything from fresh eating to hard cider. Reporter Gaen Murphree can be reached at gaenm@addisonindependent.com. Orville McLean harvests apples at Douglas Orchards in Shoreham.